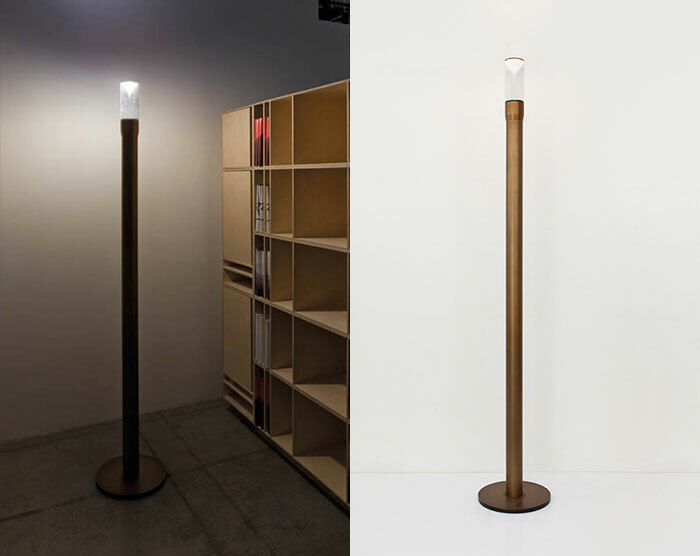 IP20 rated floor lamp for interior use, made of aluminium painted my bianco and nero royal or made in copper bronze brass. dimensions profile: 1800mm tall, on a 300mm diameter circular base, with a transparent pyrex glass element with a diameter of 80mm at the top. the glass is closed using a reflecting cone that generates indirect light. available wired with a GY6,35 50W halogen lamp or 3000K 17W 1600lm led. transformer or power supply unit included.